FansOnSale - your online store specialist for ceiling fans, fans with light, fans with remote, DC motor ceiling fans & fans accessories. 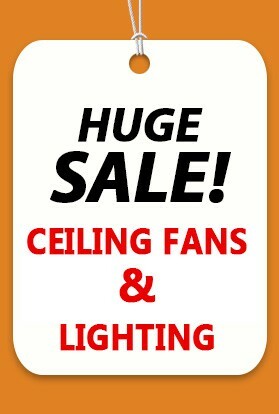 At FansOnSale we pride ourselves on having a ceiling fan style to suit any home. Whether you love modern, classic, tropical or a vintage look, we have it all. With indoor ceiling fans and outdoor ceiling fans fans in a variety of colours and styles, we have a fan for everyone! We also have a huge variety of LED lights, lighting, bathroom exhaust fans, heaters & 3-in-1 units. We are a 100% Australian owned and operated family business. We ship our products Australia wide using Australia Post eParcel: New South Wales, Victoria, Queensland, South Australia, Western Australia, Australian Capital Territory, Tasmania and Northern Territory. This service is fully insured and fully trackable. We are offering FREE SHIPPING for all orders over $200. Our friendly staff have years experience in fans and lighting product knowledge as well as in installations and servicing. Our experienced electricians have been selected by some of the leading ceiling fan manufactures as their service technician which means we know our products from both a consumer and installers point of view. We always strive to provide the best products available, which is why our electricians consult us about the brands we supply to you. This includes top brands such as Hunter Pacific, Martec, Hunter, Fanimation, Emerson, Cougar Lighting, and Brilliant Lighting. FansOnSale aims to offer the lowest prices for lighting and ceiling fans online, if you find cheaper prices anywhere else we encourage you to email us a quote or the details and we will do our very best to provide a unique competitive offer tailored especially for you. Enjoy a FREE GIFT from us with every purchase over $150.